As I mentioned previously, Janet Wong and I were lucky enough to have a proposal accepted for the recent ALA conference in Chicago and presented a session on poetry and the Common Core. We had a great audience and were able to tape a few nuggets to share here-- thanks to poet, friend, and "filmmaker," Laura Purdie Salas. Here's Janet talking for a moment about how "ageless" poetry can be-- particularly how the poems in The Poetry Friday Anthology for Middle School can work at the high school level, too. And here I am wrapping up our session with a quote about the value of poetry from First Lady Michelle Obama. We talked about why poetry is important for young people, what poetry skills are included in the Common Core Standards, and demonstrated how to share a poem while gently incorporating skill instruction. What are the expectations outlined in the Common Core? The main idea is to help children see and hear the poetic elements after enjoying the poem through multiple readings—and to come through the "back door" to skills. As we shared a poem for every grade level, we demonstrated how it could be both meaningful and fun, starting with the grown up reading the poem aloud, then inviting children to join in on reading the poem aloud (with a variety of creative strategies). Next, we pause to talk with kids about the poem, connecting it with their lives and other reading or other poems. Then, we highlight ONE SKILL that grows out of that poem organically and read the poem aloud again. Finally, we connect with another poem that is similar in some way or with a book of poetry that is similar. And all of this in five minutes! In The Poetry Friday Anthology we do all of this for you for every poem. These steps can also be applied to any poem in any other book of poetry, of course. We had the audience reading poems with us and seeing how quickly and naturally poetry could be incorporated into weekly routines (or even more often!). I think the best compliment we heard was how practical and do-able this was. Exactly! We're trying to help people who don't already share poetry feel comfortable taking those steps. For more info, check out Pomelo Books and dig up my article, "Take 5 for Poetry" in the April 2013 issue of Book Links also available here. And head on over to Todays' Little Ditty where Michelle Barnes is hosting the Poetry Friday party. See you there! 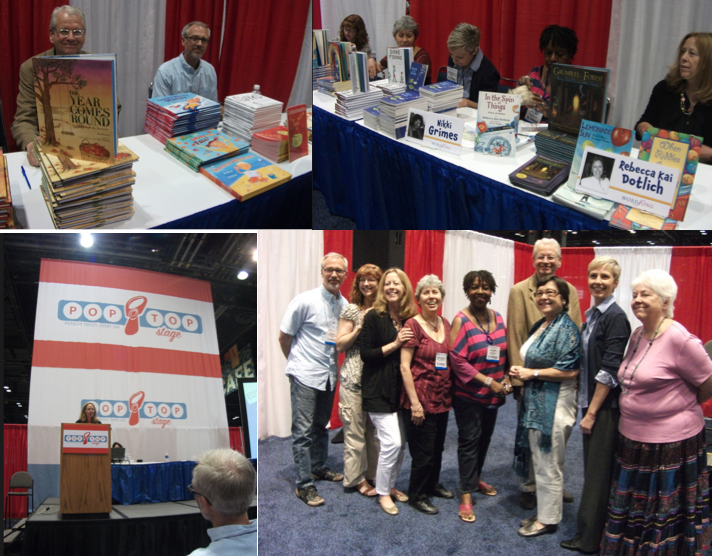 I am so happy to report that Marilyn Singer and Barbara Genco were able to bring back the Poetry Blast at the ALA convention in Chicago last weekend. This time it was held in the exhibit hall at the Pop Top stage on Monday morning. It was a nice screened off area with a great sound system, so you could hear perfectly. And as always, Marilyn and Barbara had a great line up of poets with marvelous introductions of each one. I took photos and film and am happy to share a few nuggets here. Enjoy! Rebecca Kai Dotlich read from Grumbles from the Forest, the forthcoming Grumbles from the Town, When Riddles Come Rumbling, and here's one of my favorites, her poem tribute to her dad from Lemonade Sun. Such a sweet and moving moment! I was so tickled to hear Bob Raczka (rhymes with Nebraska) since I'm a big fan of his witty Guyku and Lemonade. He read from Guyku, his forthcoming Joy in Mudville, a "Casey at the Bat" riff, and Santa's Haiku Journal. Bob definitely delivered with humor and cleverness. Kids are going to love that Joy is a girl baseball player. I did! Tamera Will Wissinger was also a new treat since I hadn't heard her read before and I love her new (first) book, Gone Fishing: A Novel in Verse. I loved how she wove a story through multiple poem forms and character voices. Loved hearing Sid Farrar read from his recent (first) book, The Year Comes Round: Haiku Through the Seasons. His dry, droll voice added a fun twist to these lovely poems for the calendar year. The marvelous Nikki Grimes read many selections from her new novel in poems, Words with Wings, with dear Ed Spicer sitting front and center-- the teacher referenced in that lovely book about the power of daydreaming. She also shared her powerful poem from Our White House: Looking In, Looking Out. And the Blast ended once again with co-host Marilyn Singer sharing some of her latest gems: poems from Follow, Follow, her new companion to Mirror, Mirror, as well as some fascinating and funny selections from her presidential poems, Rutherford B., Who Was He? Thanks to Marilyn and Barbara for fighting to bring the Blast back and to Albert Whitman (and Michelle! ), Charlesbridge (and Donna! ), Disney-Hyperion (and Dina! ), Houghton Mifflin Harcourt (and Lisa! ), and Wordsong/Boyds Mills Press (and Kerry!) for sponsoring a wonderful session. I am so glad to see the Blast back and hope it will be on the docket in Vegas next year! Poets in sparkle and sequins-- I can see it already!